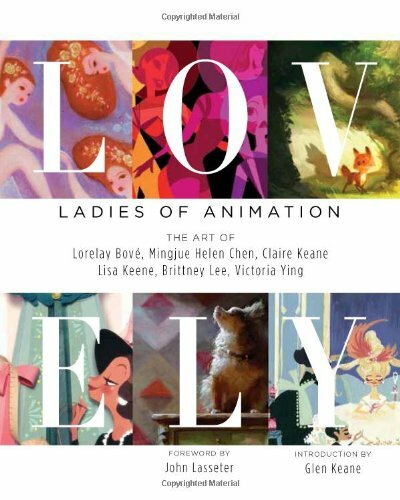 Lovely: Ladies of Animation is a beautiful artbook from six lady artists working in the animation industry, namely, Lorelay Bove, Mingjue Helen Chen, Claire Keane, Lisa Keene, Brittney Lee and Victoria Ying. This book was put on Kickstarter on 25 October 2013 with a goal of raising $7,000. In the end, it raised $118,263. That's an astounding success. The book even has a foreword by John Lasseter and introduction by Glen Keane. What I like about the book is the individual style each artist brings to the table. There are beautiful paintings from Lorelay Bove, the visual development and pen and ink drawings from Helen Chen, pastels from Claire Keane, wonderful dog paintings by Lisa Keene, painted and cutout paper collages by Brittney Lee, mixed media and lady drawings from Victoria Ying. The artworks are lovely and are accompanied by commentary from the artists. I enjoy many of the personal pieces, such as those that were inspired by overseas trips or even sketches of babies. The book's a 136-page hardcover. It's inspiring. Highly recommended.